The TTC Budget Committee will meet on Friday, November 16 to discuss the proposed 2018 Operating Budget. Fares and service will remain at 2017 levels. An additional subsidy of $36.9 million over the 2017 budgeted level will be required for the “conventional” TTC system, and a further $0.9 million for Wheel Trans. This is very much an election year budget in which the twin goals of no fare increase and minimal extra expenditure are pulled like a rabbit from a hat thanks to unusually strong results in 2017. Despite flat ridership this year, the average fare has been higher than expected largely offsetting the revenue shortfall that would otherwise have left the TTC in a deep hole for 2018. Some major expense categories, notably for diesel fuel and employee benefits, were under budget in 2017 and these savings have been rolled forward into 2018. Other cost reductions arise from a wide review of expenses through the organization. This is a “good news” story for everyone who looks at the dollars, but not at the service. The biggest new expenses for 2018 are the opening of the subway to Vaughan which will add $21.3 million and rising Presto fees as use of that fare medium grows adding $8.3 million. However, there will be only minimal additions to service within the scope allowed by the 2017 budget numbers. There is no provision for any Ridership Growth Strategy. The budget proposes a 5.5% increase in the subsidy requirement, a level higher than inflation and certainly higher than the target zero percent. This is the inevitable result of political promises to flatline revenues in the face of unavoidable costs and inflation. How that will play at the political level remains to be seen. Moreover, from recent media reports and comments at the TTC Board Meeting, we know that ridership is actually going up on parts of the bus network. How can this be reconciled with the limitation on adding more service both from a fleet and budgetary perspective. Riders are still waiting for the promised land they were sold by Mayor Tory in the last election, and his post-election acknowledgement that service really had been harmed during the Ford years. The next debate will come when the TTC brings forth new proposals, and please let this happen sooner rather than later because better transit is an important election issue. Our RGS paper and our call for two hour transfers is the battle ground to ask for more. Every year at budget time, there is much confusion over the numbers cited in various budgets, including the TTC’s. Didn’t they run a “surplus” in 2017, some will ask? Haven’t they saved money with efficiencies and cutting down on fraud? How can they flatline fares and service, and yet only require a paltry $37.6 million in new subsidy? What ever happened to the 0% target for increased city spending? When the TTC (or any City Department or Agency) talks about its new funding requirements, this is always relative to the previous year’s budget, including extra monies that may have been authorized as in-year adjustments to compensate for Council-approved changes. In 2017 (as in some past years) the TTC will not spend all of its allocated subsidy nor will it require a planned $14 million draw from a Stabilization Reserve created with previous surpluses. This arises from a combination of two factors. Riding may be down 7.8 million from projections, but the average fare is up so that total revenue is only $1.3 million short of the budgeted value. Expenses are below budget on several accounts for a saving of $50.4 million. 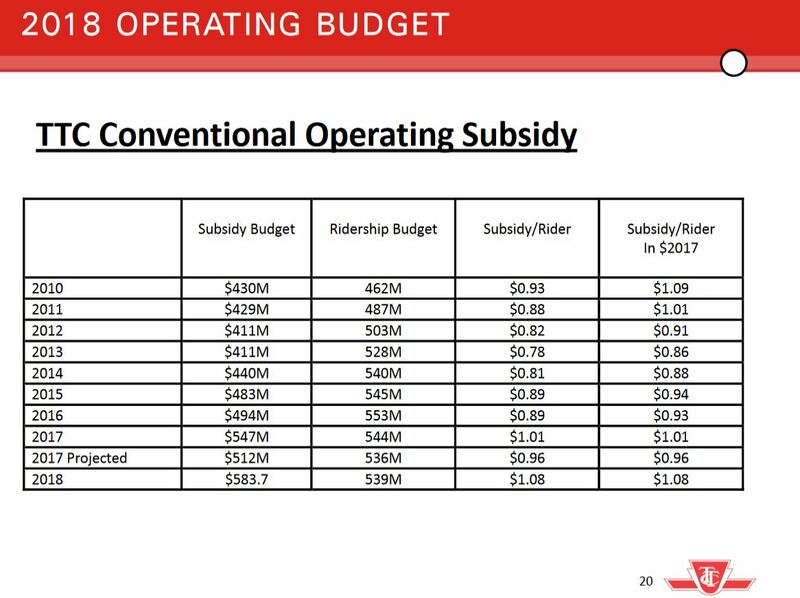 This leaves the TTC with a subsidy requirement $49.1 million lower than budgeted, and with no need for the reserve draw. 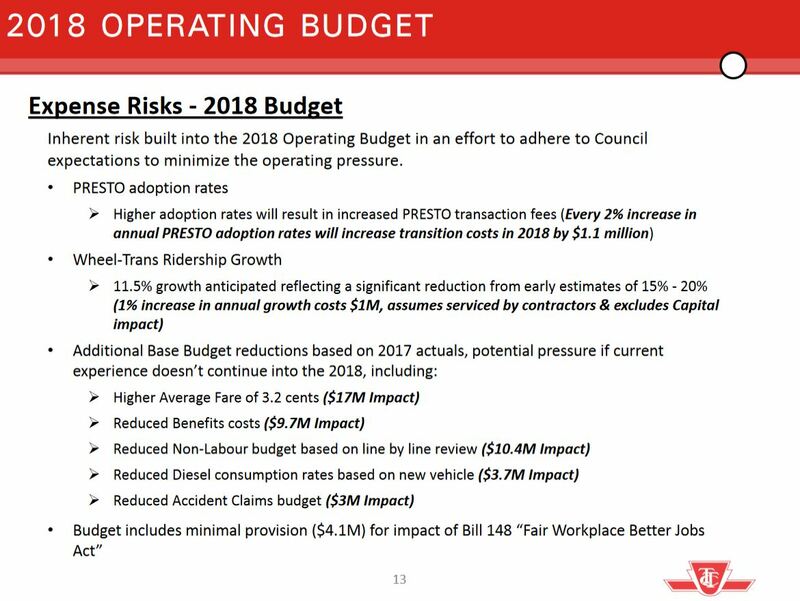 Labour costs: Down $14.4 million because of gapping, project deferrals, the transfer of some staff time to the capital budget, and the assumption by Metrolinx of frontline Presto support that was included as a TTC budget cost for 2017. Employee benefits: Down $10 million. A good chunk of this comes from reduction in fraudulent claims. Non-labour costs: Down $8 million because of better vehicle reliability and the deferral of some subway car work due to parts availability. Presto fees: Down $7 million because Metropass users have not converted at the expected rate. Diesel fuel: Down $6 million because fuel consumption has been below predictions, partly due to better weather. Hydro and utilities: Down $3 million because rates and consumption are below budget. 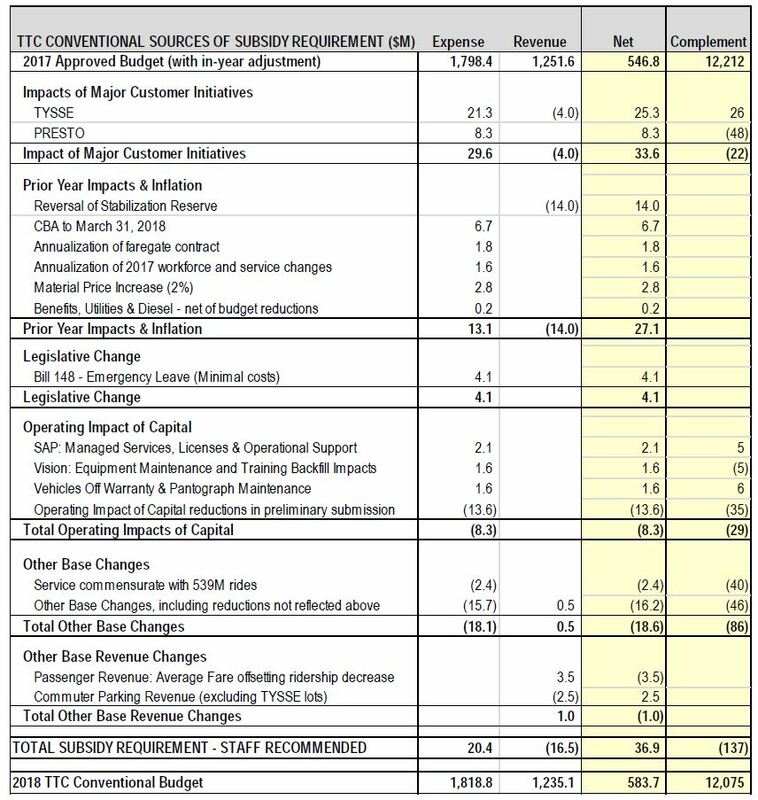 Depreciation: Down $2 million because the TTC’s unsubsidized capital purchases in 2016 were lower than expected, and thiswas not factored into the 2017 budget when it was approved. Going into 2018, a zero percent subsidy increase actually gives the TTC more money than they will actually have used in 2017, and, of course, revenue will continue to roll in at a higher rate per passenger than in the 2017 budget. These are unavoidable new costs. If the TTC had to absorb them into its budget without extra subsidy, offsetting cuts and/or a fare increase would be required. The budget seeks new subsidy funding to cover these expenses. The budget-to-budget changes are summarized in the “Key Drivers” table. The TTC booked the reserve draw in 2017 as potential revenue, and as this is not in the 2018 budget, it is a reduction year-to-year. Of course this draw was never taken, and so on an actual-to-budget basis, this item would disappear. Costs in 2018 on the base budget will rise by $38.3 million, but these are more than offset by savings of $50.6 million. Much of that saving comes from the carry-forward of the underspending in 2017. The additional cost of unavoidable items leaves the TTC requiring more subsidy in 2018 than in 2017. The chart above contains a footnote about provisional funding for the CBA, and other tables in the report show that the TTC has made provision only for three months of a CBA increase over 2017 to the end of the contract on March 31, 2018. This is the standard way the City and its agencies handle unknown future contract costs, and the “Non-Program Budget” is used to top up budgets after the effects of any new contract provisions are known. 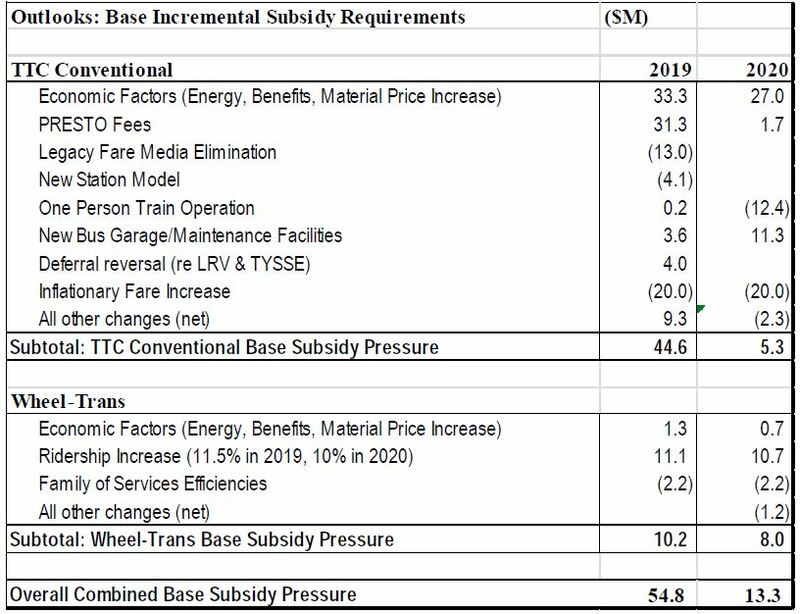 However, this has the effect of understating the likely magnitude of the TTC’s subsidy requirement once the contract adjustment is in place. This allows much back-patting by various politicians about how effective their TTC has been in controlling costs when, in fact, all of the likely costs are not in the budget. Later in the report, we will see that the estimated value of the CBA adjustment for the first quarter is $6.7 million. If the new contract is at a comparable rate, this will require an additional $20.1 million in subsidy or offsetting cuts to expenses in other areas such as service. The total increase included only 3 months’ worth of CBA at $6.7 million. The bus retirements not only eliminate the maintenance cost of old buses, but with the large number of new buses in the fleet, some routine costs will be transferred to the capital budget via the warranty. This will be an extraordinary cost increase in a few years as the warranty period ends for this large portion of the bus fleet. After the initial version of the budget, there was more trimming. 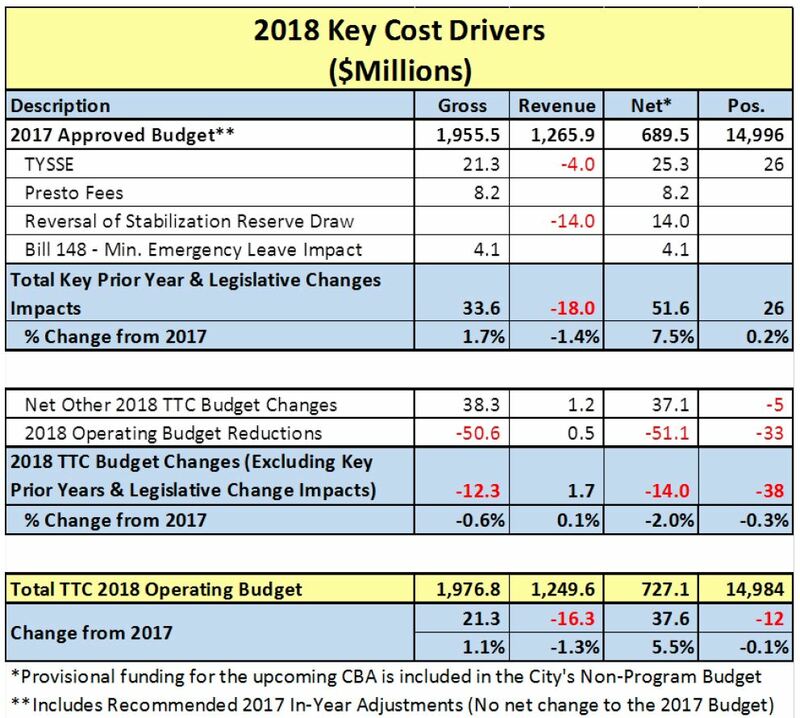 Vehicle and Facility Maintenance costs have been adjusted based on actual experience in 2017 notably with hybrid bus batteries, the effect of recent trackwork, and lower contract pricing and “refined” requirements for T1 subway car maintenance. The projected cost of benefits has been reduced further from the first round of changes based on elimination of fraudulent claims. Diesel fuel costs are expected to drop through a combination of new buses, fuel efficiency and a lower price. Utility prices are also expected to drop. Accident claims have fallen due to legislative changes and the use of video evidence. The Materials & Procurement Department has improved various procedures, and some of the actions detailed in the report are aresult of a review by the City’s Auditor General. Slow deliveries of the new Flexity streetcars reduces staffing required at Leslie Barns, although this is partly offset by hiring for maintenance of the pantographs. With the consolidation of the Metropass VIP program (Volume Incentive Purchase) into the MDP (Monthly Discount Plan), the TTC expects a small rise in Metropass revenue. Yet another round of budget revisions brought more reductions. Presto costs are expected to be lower than originally planned because the full transition to fare cards will not occur as soon as originally hoped. TYSSE costs have been reduced by “the deferral of certain maintenance requirements”. Whether this is a real saving, or merely pushing costs off to future budget years is not clear, although there is a reversing entry in the projected 2019 estimates shown later in this report. Because the new TR subway trains are performing exceptionally well, the cost effect of their end of warranty was less than originally budgeted. When all this is stirred together, the version of the conventional system budget presented by staff requires a subsidy increase of $36.9 million, or of $22.9 million if the City uses the Stabilization Reserve as a partial offset. There may be a temptation to use the reserve to minimize the subsidy requirement and related tax pressure, but TTC staff warn that this will eliminate any buffer against future unexpected costs. Unlike other parts of the budget report, the ridership table shows both the 2017 budget and probably actual values. This illustrates the evolution of revenue estimates for 2017 and how this flows into 2018. The 2018 budgeted ridership is 539 million, below the 543.8 million budgeted for 2017, but above the 536 million expected for this year. 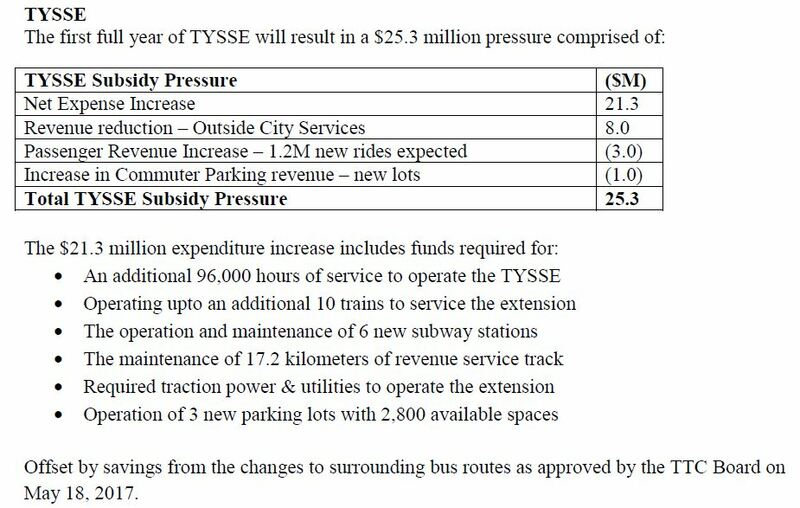 1.2 million new rides are projected for the TYSSE which, at an average fare of $2.1807 represents $2.62 million in new revenue, not a huge gain considering the operating and capital costs. If a York-TTC co-fare is implemented, the revenue will fall further unless the TTC is “made whole” for carrying riders who cross the Steeles Avenue boundary. The average fare is above budget for 2017, but there is a projection that it will continue to rise even without a fare increase in 2018 by a small amount. The overall result is that fare revenue is expected to be $7 million higher on a budget-to-budget basis. Service planned for 2018 will increase in budgeted hours primarily because of the subway extension which is not completely offset by cuts in the bus network. Streetcar hours will be budgeted based on the fleet as it exists rather than the higher level originally set for 2017, and bus hours will be adjusted upward to compensate. Until Bombardier’s delivery (or non-delivery) schedule proves to be reliable, the long term balance in services is difficult to project. Wheel-Trans demand in 2017 was considerably below the budgeted level. Although the projected 2018 increase is 11.5% above the actual level for 2017, it is only 1.8% above the 2017 budget. This means that the City does not face a large increase in the Wheel-Trans subsidy for 2018 even in the face of strong demand. From time to time there are calls to eliminate advertising on the TTC. That is more easily said than done for two reasons. First, there is a long term contract that cannot be cancelled overnight. This 12-year contract took effect on January 1, 2012, and the TTC has the option of two five-year extensions. Second, and more importantly, advertising will bring $28.35 million to the budget in 2018. Replacing that amount is more than what has been projected as the cost for a two hour transfer, or it could pay for proposed lower fares in the City’s poverty reduction strategy, or it could pay for better service. Other non-fare revenue includes $10.6 million in rent (primarily for subway station concession stands) and $10.8 million from commuter parking. Appendix B lists several areas where the TTC (and hence City) could be exposed to risk because of the changes made in the 2018 budget. Collectively, what these show is that some of the contingency (which the more cynical would call “fat”) provisions in the budget have been trimmed away, and there is less room to absorb unexpected costs in 2018. 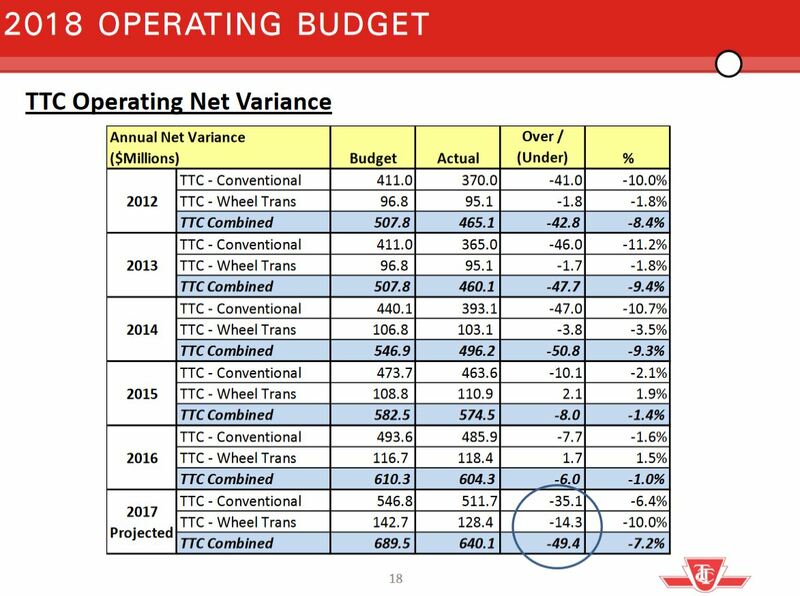 A related issue, of course, is that some of the savings obtained in 2017 relative to budget will not occur in 2018 because they are already “baked in” and the TTC must look to new windfalls. This entry was posted in Fares & Fare Collection, Finance, Service Cost and Quality, Spadina Subway. Bookmark the permalink. That’s not a positive thing in my books. That’s very much a negative thing. No streetcars west of Roncesvalles, depriving bus routes of extra buses. Plus, no increases overall to the network. Steve, once you have more information, I have a question: will the buses made surplus by the Spadina extension be used to improve service on other bus routes? Steve: That’s what is supposed to happen. Also tentative dates for Queen West are early 2018 to Humber and summer to Long Branch. It is also possible Queen will be rescheduled based on all CLRV service as King is taken over by Flexitys and ALRVs. We won’t know for sure on that for a while yet. 23 months ago, the TTC voted to look at peak and off-peak pricing as part of the 2018 budget process. Steve: No doubt it’s in the long awaited but not yet delivered Ridership Growth Strategy. nfitz said: 23 months ago, the TTC voted to look at peak and off-peak pricing as part of the 2018 budget process. So were is it? I have to admit, either way they slice this, this makes me nervous, as I am terrified they will not reasonably look at the way this will drive decisions. I understand there are good reasons to want to push riders to off peak times, but I worry this will end up over time being an effective fare hike on peak. Peak hour fare pricing might be an immediate on peak fare increase. If they were to go through with that, I could see them setting off peak fares lower at the same time as on peak fares higher to provide a carrot and stick to entice people to travel off peak, while being able to claim a minimal change to the average fare. The problem there is that while it is great for people who can change their travel times, not everybody can, and it’ll nail those who have set working hours and no job flexibility to change their start and end times or work from home twice a day, every day. The problem is not dissimilar from the time of day electricity pricing with smart hydro meters. If your circumstances permit you to change when you use it, you can save money. On the other hand, if you can’t, you have no choice but to fork over and pay. I’m sympathetic to the idea of smoothing out demand bumps with both but is this going to cause elevated pricing to land on those who can least afford and least avoid it? I don’t see how peak hour fare differential would work with the present Metropass model (which is being migrated as-is to Presto). If there’s a special add-on required to make a Metropass valid during peak hours, that becomes almost an automatic fare increase, because it’s likely most Metropass users would find it hard to justify a Metropass that’s not valid 7-9 AM and 4-6 PM (or whatever the peak times would be). Even if your regular travel patterns avoid those hours, the utility of a Metropass is being able to take a trip wherever, whenever, without an incremental cost.